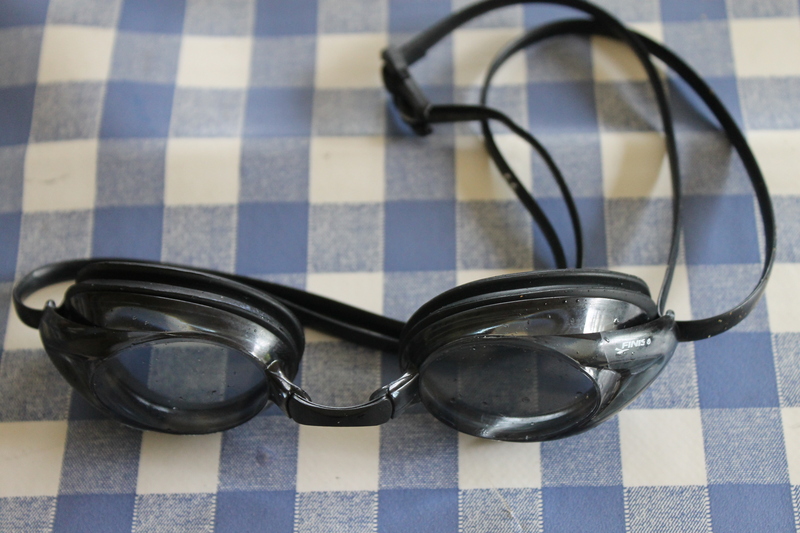 I’ve previously reviewed Aquasphere Kaiman and Kayennes for open water swimming and that I hadn’t previously been successful with using low profile goggs. I had settled into my Aquasphere use over years. I swam in them in pool and open water from November until last month when the heavy usage was starting to take its toll with the mirror finish wearing off. I went looking for a replacement pair but discovered that View only sell in the US or Australia and with rather expensive shipping costs, which would have made replacements almost the cost of the new Speedo Fastskin goggles, i.e. the most expensive goggles on the market, so I had to discard the idea. 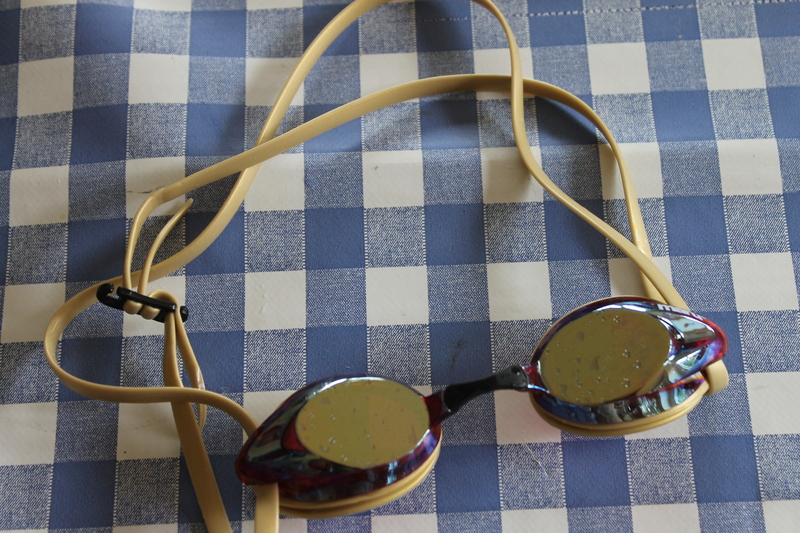 The advantage was that I now had a good idea that competition goggles would fit me fine, and were in fact quite good for open water if you were comfortable with them, and that I knew which type to choose. Thanks to two vouchers for writing an article for an online swim shop and a gift voucher, I selected a few pairs that seems closest. All these goggles come with adjustable nose bridge pieces. Most were tested over the course of a few weeks, in both pool and sea. I started with a pair of Maru Pro competition googles. 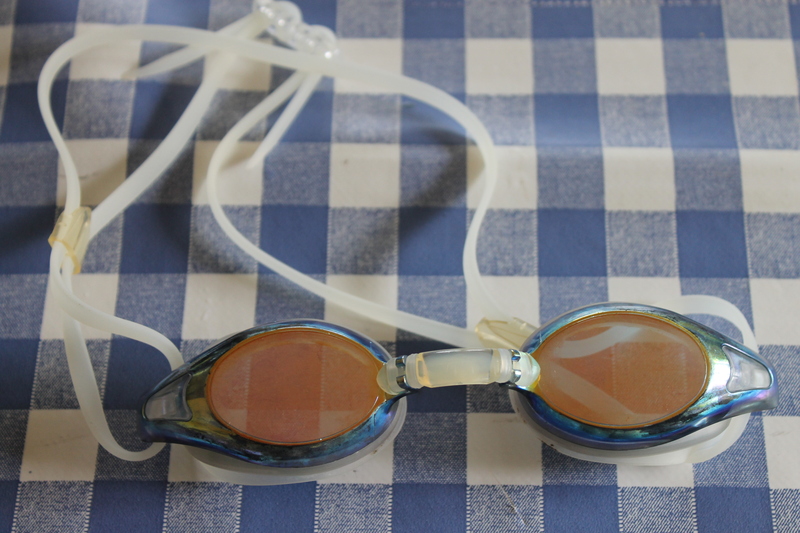 Maru are especially popular as suppliers of swimming equipment and basic goggles and caps to pools for kids in Ireland and the UK. They are obviously trying to break into a wider swimming market. They were also the cheapest of the lot. Unfortunately while the fit was okay, they were far too dark. 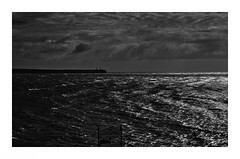 It was like swimming just before dark. The red plastic confused my peripheral vision, I couldn’t tell if some was passing me in the lane and even my arm was barely visible. The gold trim and straps may appeal to some kids people. I am not one of them. 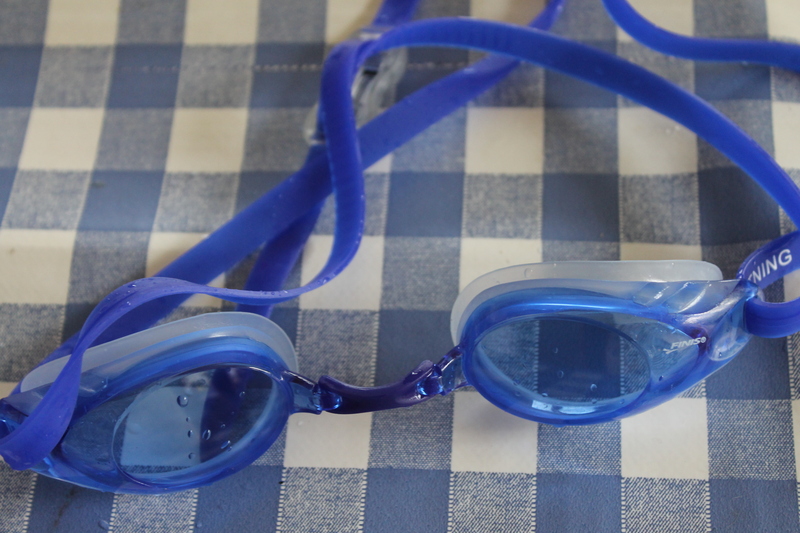 After staring at all the range available in a Cork sports shop (which shall no longer named), most of which were useless, I picked up a pair of Finis Thunder goggles, black with smoke lenses (almost clear). I would have chosen a pair of Mirrored ones, but the only pair were accidentally on the shelf after being returned for a broke strap. I loved these. They were very similar to the Fully Sicks. But the end of the strap snapped off the second day. That pair that were returned to the sport shop obviously weren’t an aberration. But they were comfortable with fantastic visibility, so I got a pair of the mirrored Jade ones online using my voucher. It got odd. The mirrored pair of the same goggles just wouldn’t seal. I took them to the pool where they leaked immediately. I did get them to fit over a couple of days by changing the nose piece … twice. So on one pair I use a medium bridge, and on the other an Extra Large. Though once I had them fitted, the visibility on the mirrored pair was fine, clear and not too dark. When I added a third pair, I needed another different size nose bridge, large. They look great but this is typical of my experience with Finis products. Their design is unparalleled, but they are regularly let down by reliability (SwiMP3 which died, PT paddles which split, & now odd goggles). In this case at least, spare straps aren’t a big deal. 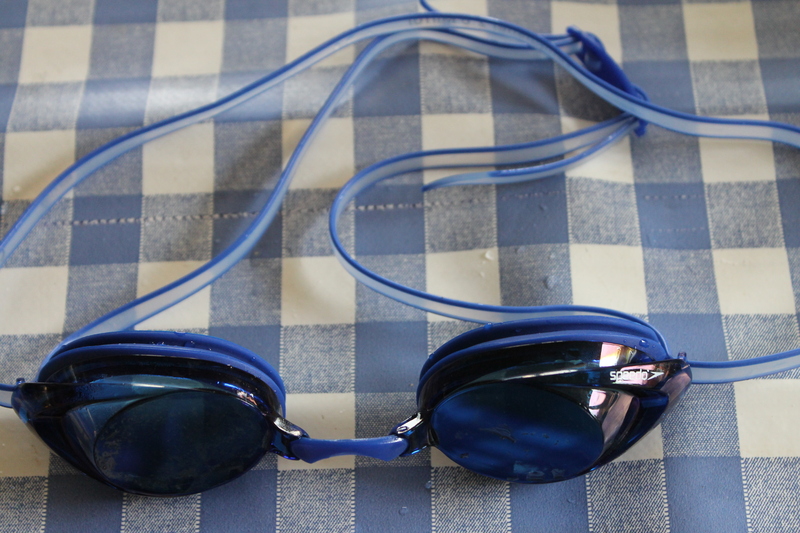 Since the first Thunders had been so good, I ordered one pair of Finis Lightning googles, which were only available in blue when I was purchasing. I think the Lightnings are meant to be slightly above the Thunders (duh). These were fantastic. Similar to the Thunders, the translucent white silicon gasket of the seal was softer. These were super comfortable and perfectly fitting immediately, with the same great visibility of the Thunders. I still had a pair to test. You’d probably never do this, buying a bunch of goggles at the same time to try them out, without having a gift voucher of some kind. I’ve certainly never done it before, but I found some great advantages from doing it. And it made me wonder, if then I was going through the fifteen or so goggles I tried in 12 months when I was starting, if everything I’d chosen had been just leisure swimming goggles. They’re all long gone so I don’t remember. The last pair was the famous Speedo Vanquishers. Renowned in competitive swimming, I bowed to finally try them (I kind of dislike Speedo’s synonymous-with-swimming branding, so had restricted myself to Speedo Endurance swim briefs, the best chlorine togs, bar none, that I’d tried). They were worthy of the reputation. These were also great, comfortable, the blue frame and lens were a little dark for the pool but the fit of the nose bridge was better than any of the others, due to that slight concave shape on the bottom. So out of all, only the Maru Pros failed. The rest were all good or great. I went through this so I could get at least two pairs tested for Manhattan, with which I would be most comfortable. In the usual pre-swim panic, I’ll probably have brought most to New York. My first choice will be the Finis Lightnings if the day is brighter and possibly the Speedo Vanquishers as the probable choice for a duller day. 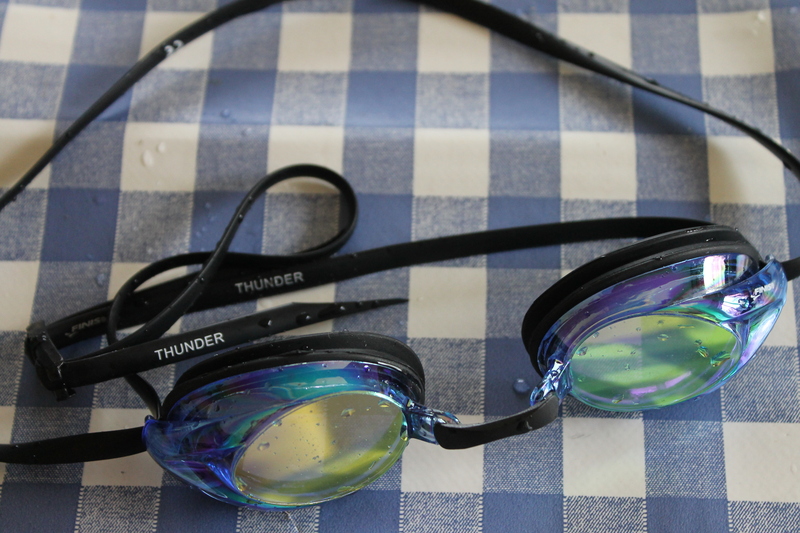 Update: I’ve been using each pair of Thunder and Lightning googles now for over a year in open water, the blue Lightning on dull days and the mirrored Thunders on sunny days, and both are excellent recommended with the Lightning placed ahead as the Thunder does occasional separate at the nose-bridge when putting them on (but never in the water). Thanks for the reviews, they are very helpful. I have also had a good experience with the Finis Lighting. In fact, I’m just buying a second pair.